This is the story of Attila. Attila (the bun) normally attacks his food voraciously. He loooooves his food! He is a rabbit after all, and that is what they do for a living (beside being cute and great family members). Eat, eat, eat (and poop). Until one day, Attila was unwell, and didn't eat (nor poop). Which is when Attila came in to see me. Attila is on the very best of rabbit food, high in dietary fibre, and plenty of access to grass. He is spoilt rotten, and everyone was devastated that he was suffering, and might not survive his illness. Our examination revealed a large "mass" in his abdomen. That large mass was his stomach, which had distended with food, maybe hair from grooming, and gas, and things were not able to pass from his stomach to his intestines. Rabbits can't vomit, so all of this was accumulating there, causing him to get sicker and sicker. Whilst we do not know what triggered this in Attila, in many rabbits it can be a combination of eating too much low fibre foods, ingesting too much hair from grooming, other illnesses (such as pain, kidney, liver disease or stress) or an obstruction in the intestine. A rabbit that is not eating, not drinking, not pooping, and sitting there not wanting to move. They can sometimes be hunched in the back because their tummy hurts, and grind their teeth (because of pain). If you put your hands over your rabbits tummy now, what you should feel is not much, generally soft and squishable. 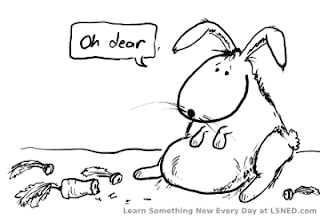 If you palpate the tummy of a rabbit with gastric stasis, it feels like there is a water balloon in the upper part of the abdomen, and the rabbit usually groans (in pain). 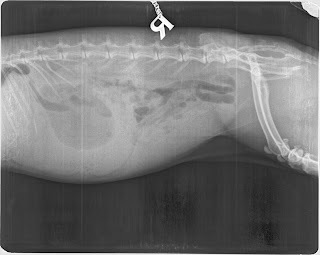 The radiograph! We need to do tests to find out more, as after all, lots of things can make rabbits not eat, not drink and not poop. 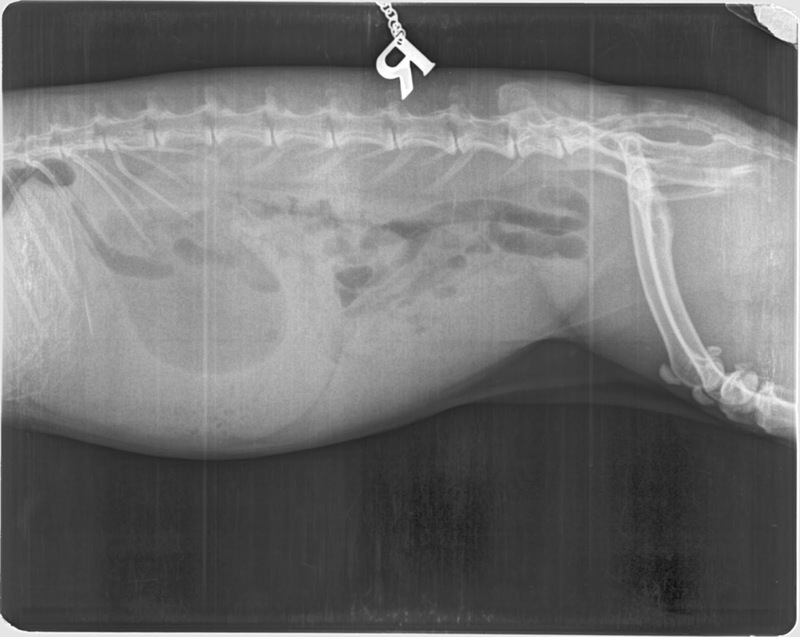 What you will see in this xray is that the stomach is huge (it looks like a big balloon, with food around the edge and a big gas pocket in the middle. Sometimes we need to do blood tests (although we did not do that in Attila). The radiographs and the examination was enough to confirm what he had, and with that diagnosis, we had a plan. Attila had a tummy massage - well, we massaged his stomach to mix the food with the liquids to help the stomach empty. He was given fluids under his skin to help rehydrate him, as well as antibiotics and pain relief. But most importantly, he was being syringe fed food (we use Oxbow Critical Care), each few hours, and enemas (to promote defecation). By the next day, his stomach was one quarter of the size, and he passed his first poop. So we did a "poopy" dance to celebrate. Yes, we are that mad. We were so excited, as this meant that he had turned the corner and he was going to be fine. When he ate his first blade of grass, we again performed another "happy" dance. You see, that is what is like for a vet - we take anything as a "win", and we get excited when we know that we have made a difference in an animals life. That is what we have dedicated our lives to. Unfortunately for Attila, this can be a recurrent problem, especially as we do not know what the trigger was for him (as he is already on a high fibre Timothy Hay diet). His family are going to monitor his appetite, pooping, diet. They have on hand Critical care to give to him at the very outset of any signs of not eating, and they know they need to gently massage his abdomen to help things move along. Sometimes, in some rabbits, it may not always go well, and surgery may be needed to remove the obstruction. Here are some links to some of our other posts about Rabbits..
What can you do at home if you suspect this? 4. Get your pet to a vet as soon as possible - medications are needed to help with pain and infection. Any general questions, let us know. Any specific questions on the care of your rabbit, please speak with your local friendly vet (and if that is us, then let us know). 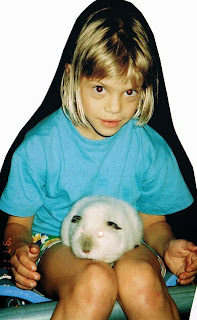 This is a very young Nurse Tegan, with one of our bunnies from years ago.